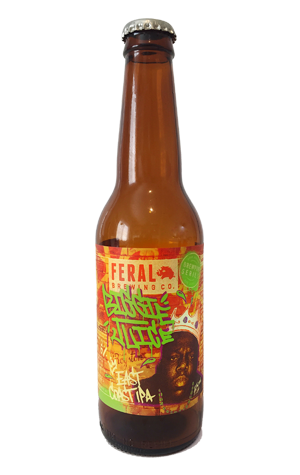 The momentum around Feral’s Biggie Juice continues as the turbid, tropical NEIPA – here labeled an East Coast IPA – rolls out of the Perth brewery as its latest Brewpub Series release. What began last May as a one-off collab for Good Beer Week with friends from the Royston in Melbourne – featured on the label here – evolved into a highly sought after beer that eventually landed 88th place in 2017’s Hottest 100, one of the few draught only entries to do so, as well as a slot in our Best New WA Beers of 2017 list. While conjecture around the style is fervent, fuelled by the likes of Brooklyn Brewery guru Garratt Oliver quipping that the ascendance of NEIPAs was the world first Instagram based beer style, there's little doubt about its broad appeal. Low bitterness, layers of apricot, peaches and passionfruit and a creamy mouthfeel almost make this a gateway beer for many into a world of craftier options. Whether NEIPAs ultimately go the way of Black IPA dinosaurs or hold onto a more permanent spot in beer's ever richer tapestry remains to be seen. However, the hazy epoch is upon us and its persuasive fogginess could very well see Biggie Juice become a core range beer.